Available Now | Divine Exchange Ministry, Inc.
Who Is God? Who Am I? Why Am I Here? Why Do I Act This Way? These challenging questions are roots to the unhealthy long-sufferings many people are experiencing today. Countless individuals have experience childhood abuse and traumas that destroys the development of spiritual wellness. 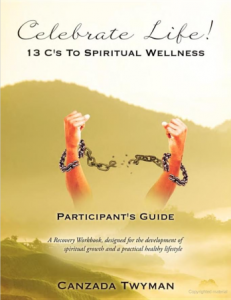 This publication limited release participant’s guide reveals 13 words beginning with the letter C that will guide individuals back on the right path to developing a healthy spiritual lifestyle. Each word unfolds the past, present, and future concept in a spiritual and clinical perspective. God’s Truth is exposed to reveal the change process for a complete lifestyle of spiritual wellness. Canzada Twyman is the Founding Executive Director of the Divine Exchange Ministry, Inc. (DEMI). She is the wife of Gary A. Twyman, Sr., who is the Chief Executive Officer, and together they are life time partners; ministering in the rural and urban inner-city communities, providing a continuum of prevention and intervention educational services to the abused, disadvantaged, and underserved youth and adults. Canzada is a survivor of sexual & substance abuse, trauma, domestic violence, and damaged emotions. She is a daughter, mother, grandmother, aunt, sister, and friend to many. She is an ordained elder, author, teacher, preacher, and evangelist, who has obtained a Master of Human Service degree, Master Advance Counseling Certification in Mental Health, Substance Abuse, and Clinical Supervision. She is an International Certified Advanced Alcohol and Drug/Co-Occurring Disorders Professional Diplomat and a National Training Provider for NAADAC, The Association for Addictions Professionals. She is indeed an AGENT of CHANGE, who serves diligently in her local church, faith-based communities, the human and social service public health arena, for the past 18+ years. She is forever grateful to the Almighty God and all those who serve, support, and understand her God-given visions.